Berlioz died on 8 March 1869. Eighteen years later, on the anniversary of his death, a monument in his memory was inaugurated at the Montmartre Cemetery. A few days later, a report of the inauguration of the monument was published in Le Monde Illustré in Paris. The original text of this report and the accompanying image were scanned from our own copy of the issue of 19 March 1887 of Le Monde Illustré, and are reproduced below together with our English translation of the report. On Tuesday 8 March, at 2 o’clock, the inauguration of the funeral monument in memory of Berlioz took place at the Montmartre Cemetery. This monument, constructed by the architect M. A. Jouvin, is located at the bottom of the Cemetery in the 7th Division. 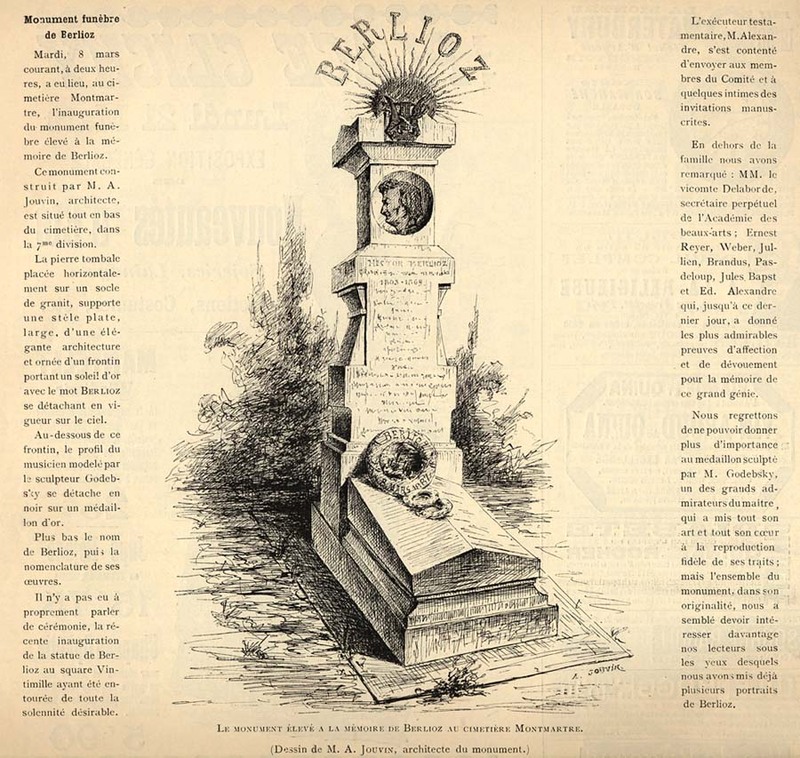 The tombstone, placed horizontally on a granite plinth, supports a large flat stele of elegant architecture; it is adorned with a pediment which supports a golden sun with the word BERLIOZ standing out sharply against the sky. Beneath this pediment, the musician’s profile modelled by the sculptor Godebsky stands out in black on a golden medallion. Further down are Berlioz’s name and a list of his works. There was no ceremony properly speaking, as the recent inauguration of Berlioz’s statue at the Square Vintimille was surrounded with all the desired solemnity. The executor of [Berlioz’s] will, M. Alexandre, sent only a few hand-written invitations to the members of the Committee and a few close friends and relatives. Apart from members of the family, we noted Messrs Viscount Delaborde, the permanent secretary of the Académie des beaux-arts, Ernest Reyer, Weber, Jullien, Brandus, Pasdeloup, Jules Bapst and Ed. Alexandre who, up to the last day, has given the most admirable proof of his affection for and devotion to the memory of this great genius. We regret we are unable to give more prominence to the medallion sculpted by M. Godebsky, one of the greatest admirers of the Master, who put all his artistic skill and heart in the faithful reproduction of his features. But we thought that the monument as a whole, in its originality, would be of greater interest to our readers, as we have already placed before their eyes several portraits of Berlioz. THE MONUMENT ERECTED TO THE MEMORY OF BERLIOZ AT THE MONTMARTRE CEMETERY. The Hector Berlioz Website was created on 18 July 1997 by Monir Tayeb and Michel Austin; this page created on 8 March 2007.